I very rarely make soup without some sort of grilled sandwich to go along side it. With meaty soups, it’s always just a variation of grilled cheese, but when I want to make a panini with protein in it, like grilled ham and cheese, chicken sandwiches, or hot pastrami or something, it always seems weird to make a meaty soup as well. Know what I mean? So I like having a good repertoire of meatless soups for that purpose (because, ya know, what other purpose could there possibly be other than allowing prime circumstances for consuming the preferred carbohydrate companion?) My only problem with meatless soups is that sometimes they’re not very filling, but not so with this one. This thing is packed with veggies and beans- and honestly, just by looking at the recipe it doesn’t look all that impressive. Vegetables. Seasonings. Whatever. But take my word, it’s amazing. My sister-in-law Emily brought it over for dinner a few weeks ago and every single one of my young boys ate multiple bowls. Did you take that in? Three picky kids, ages 7, 4, and 2, willingly ate repeat servings of a soup that consists almost 100% of vegetables and we didn’t even cover the top with cheese or croutons to hide that fact or tell them that anything white was just chicken like I usually do. That says something right there. Emily was kind enough to share the recipe and I’ve made it twice in the past week because it’s so yummy. I’ve changed it only slightly, simply increasing the amount of vegetables and seasonings and altering the cooking method directions. After a little Googling, I see that this basic recipe appears all over the internet, referred to as a knock-off of the Olive Garden’s. So who knows where it originated, but it’s sure gotten around, and for good reason. 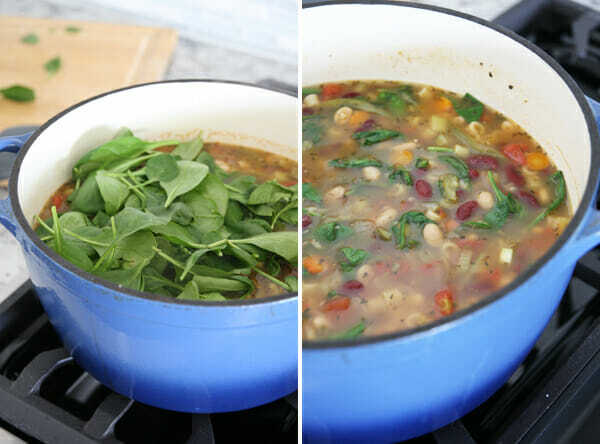 We do have another great Minestrone recipe on Our Best Bites. It’s fantastic, but with a beef tomato base, and Italian sausage in it, it’s a completely different dish. Just look at the ingredients going into this soup; it’s like an entire week’s worth of vegetables. 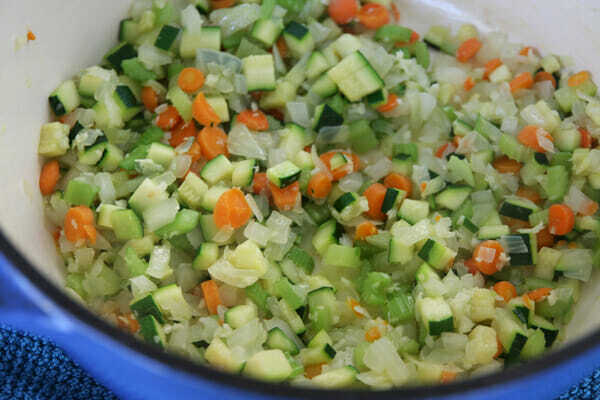 Start with the trifecta, known as “mirepoix”in French. It’s the start to many great recipes, especially soups: carrots, celery, and onion. You’ll notice bits of zucchini in mine too, but that’s just because they were all hanging out on my cutting board together for their photoshoot. After those cook for a few minutes and the onions start to look translucent, add the garlic and the zucchini. 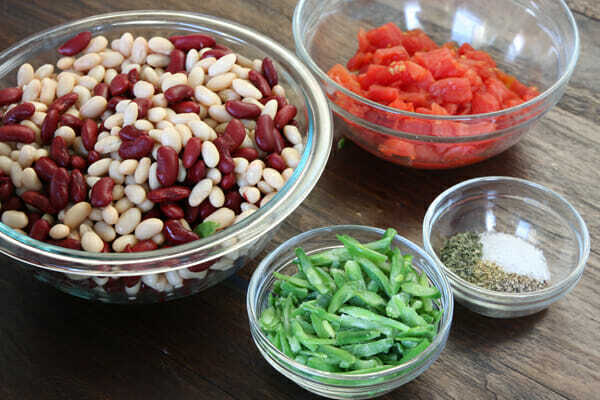 Next, two kinds of beans (both kidney and white beans), tomatoes, green beans, and seasonings. Note that the canned tomatoes are drained so the finished soup isn’t red and tomato based like many minestrones are, but rather in a lighter broth. Look at all that goodness. It may not seem like it would taste all that impressive now, but something magical happens when it hangs out in a pot for a while. Add in seasonings, like thyme, basil, salt, pepper, and oregano. Cover everything with vegetable broth and water. I have to say, there was a time in my life when I avoided anything with vegetable broth- or at least subbed chicken broth because it just seemed like it would have so much more flavor. But I was wrong, a good vegetable broth adds tremendous flavor and in a recipe like this, is key. When the veggies are tender, add a little bit of pasta. Any small-ish pasta is fine, like shells, mini bowties, etc. 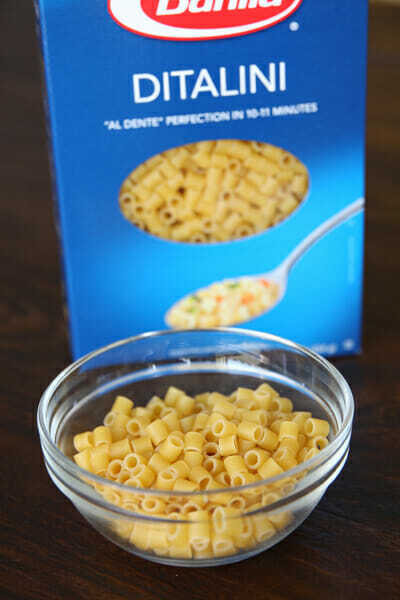 I like ditalini because it’s the same size and shape as the veggies and beans so it blends in nicely. After the pasta is cooked through, remove the pot from heat and stir in a giant handful of fresh spinach leaves and some fresh minced parsley. I like my soups like Rachel Rae describes “Stoups.” Something thicker than a soup but thinner than a stew. This is definitely packed full of beans and veggies so if you like a brothy soup, you might want to grab a little extra vegetable broth. Pair it with a grilled ham and cheese for a hearty, filling meal. I’m still kind of shocked my kids all like this so much, with visible vegetables and all, but until they complain I’ll keep making it and smile knowing they’re actually enjoying their veggies. Since this makes quite a bit, it works great to put in individual servings in the freezer. Just heat up for lunch, or take to work and you’re good to go. Recipe slightly adapted from my fab sis-in-law Emily and lots of sources on the net. 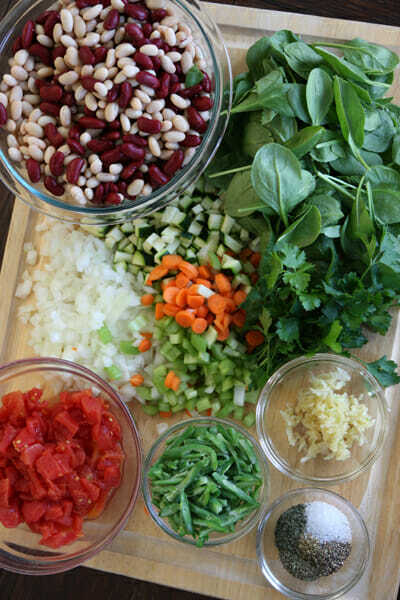 Beans and veggies make the best soups, and yours looks great. Plus, who could resist all those colors. This soup looks delicious! Can’t wait to try. I love soup and could eat it every day. My family on the other hand will only allow it once a week. This will be our weekly soup next week. This does look delicious. My ques. is about the pasta- is it needed, can I sub. rice or quinoa noodles or just leave it out? I know that probably means it’s not minestrone so to speak but Mr Wheat Allergy means no pasta in this house. Thanks for all the great recipes. Can’t wait to see all of your kitchen! That stove looks wonderful! You betcha. Leave it out or sub any of the things you mentioned for Mr. Wheat Allergy. Just use regular quinoa instead of white noodles. It is delish! Who knew soup could be so pretty? YUM! I love hearty soups too. Oh my gosh, that KITCHEN. I might die. 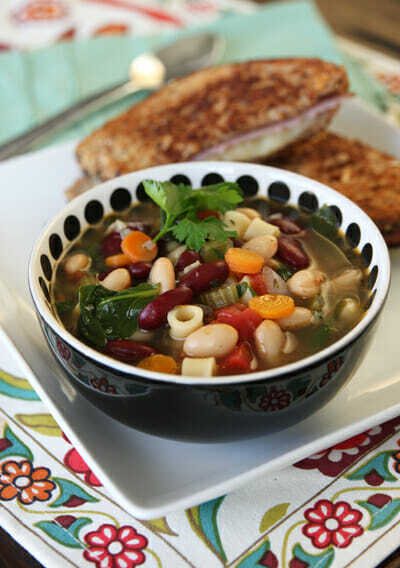 Your other minestrone is my husband’s favorite soup of all time. So when I make this one, I might just call it veggie soup so he’s not disappointed by the difference. This one looks amazing too. I’ll be making it when my vegetarian sister comes to town. This soup looks amazing, and perfect for these super-cold days we’re having in Idaho. I don’t have high hopes for my kids eating much of it (they wrote the book on picky) but I’ll just pair it with the sandwiches or, my fallback, garlic bread, and make it anyway! This looks delicious and I can’t WAIT to try it! I have a question, not necessarily related to this particular recipe: How do you figure out the nutritional break-down of the recipes? Is there a website that helps you calculate it? If so, do you have any idea how I could figure out the fiber amount? I know, it’s a huge pain for you guys to do all that so I’m just curious how I could figure it myself. Thanks for all the yumminess! There’s tons of websites where you can pop in a recipe and have it give you the nutritional info, just google and you’ll find a bunch. I’ve used Sparkpeople.com before. I use a Bodybugg calorie counter so my software automatically does that and I track my total daily fiber intake, so it just takes time to look it up for a single recipe. If I remember though, I’ll try to include it! Any bean you like, really. 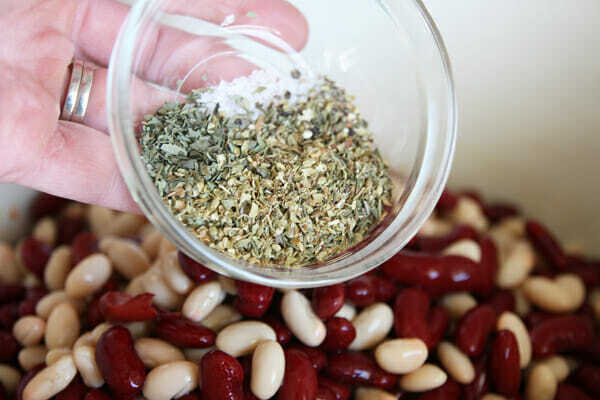 You could always just leave out the kidney beans, there’s 4 whole cans in there so there’s beans to spare! 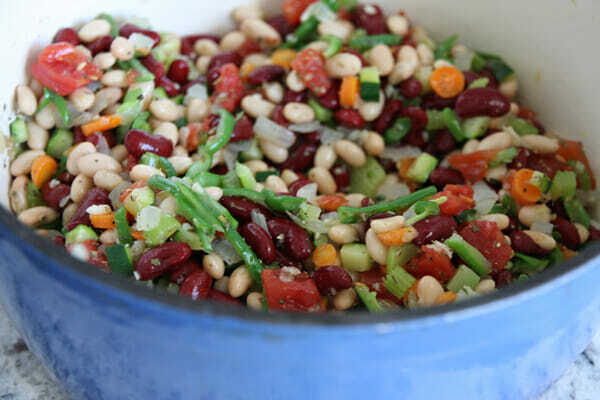 If you do like it really packed with beans, like the recipe calls for, you could add an extra can of white beans in there. We are building a house and I am trying to choose a new stove. Can I ask for more details about yours? Brand etc? Thanks! Misty, I put Thermador appliances in my new kitchen. This is the range I got and I absolutely love it. There’s a warming drawer underneath it that you can see in that photo. I’m going to do a whole post on my kitchen appliances this month so that might be helpful as you plan. How fun you’re building a house, we’re sure happy to be in ours now! I tell my kids anything white is chicken too. My 2-year-old loves the weeknight chili; let’s see if I can get his sister to love this soup! I’ve been trying to copy Olive Garden because I’m sick of spending the money just for soup. That is the only reason I go there. I have a Minestrone soup recipe that I really enjoy but I may have to give it a try. I’m try to cook vegetarian one to two times per week. It would be perfect. 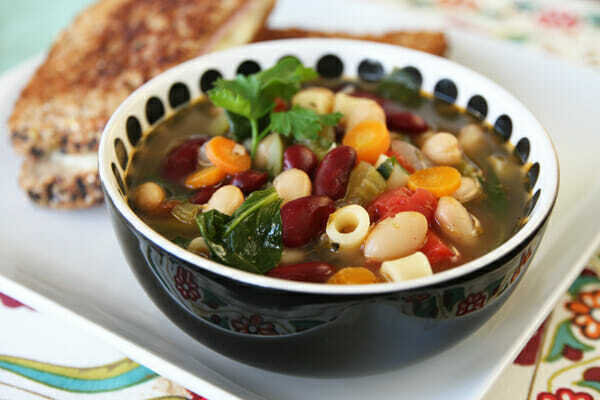 I have a Minestrone soup recipe that I really enjoy but I may have to give it a try. I’m trying to cook vegetarian one to two times per week. It would be perfect. This looks fabulous! Thanks for another great recipe! Just curious- is 30 grams of fat per serving correct? Thanks so much for denoting the amount of servings. My children have left for college (sniff, sniff) so just 2 of us at home—- could I freeze the leftovers into several containers and have soup once/week/month? Yep- soup freezes beautifully! You could also easily cut this recipe in half. Awesome! I can’t wait to make this! 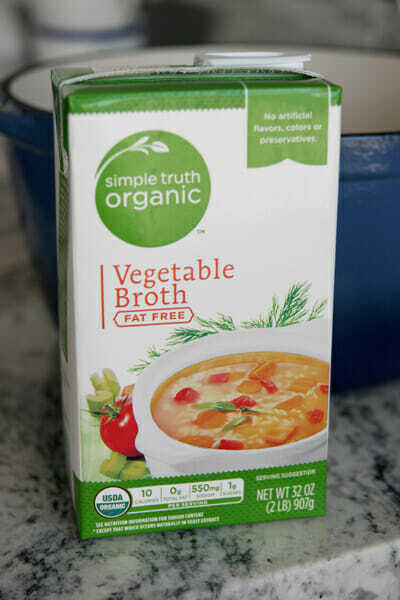 I always steered clear of veggie broth because it was so much higher in sodium than chicken. Maybe I’ll try the brand you used. It doesn’t take too much salt for me to think there’s too much, but I’m willing to give it another go! How do you feel about reheating soup that has pasta in it? I think if I was making this soup, I might cook just the amount of pasta I needed for the servings that time and add it separately. I know this is extra work, but I don’t like how pasta becomes bloated and overcooked upon reheating. I can’t wait to try this. I try doing a soup once a week at least and my family loves them. I’ve never tried a good minestrone so I am looking forward to trying this one. I’m so excited to try this. I’ve recently been searching for a good minestrone! Thank you!! It is amazing the alchemy that can occur with fresh veggies in a pot, isn’t it? My toddler has just started to try soup, and getting veggies in him can sometimes be a challenge, so I’ll have to give this one a try. I used a quinoa/corn based spaghetti instead of the ditalini and made it gluten free. I have to share a tip about fresh spinach in soup. My kids don’t like whole spinach leaves in their soup, and honestly, neither do I. I prefer them smaller. But I also don’t like chopping spinach. So I put the bag of spinach in the freezer. Mwhen I want to use it, I pull it out and crunch it in my hands a little. It breaks right up and thaws almost instantly in the soup. Instant chopped spinach. And it keeps the spinach from going bad if I don’t use it right away. So nice since spinach has that pesky habit of going bad in just a day or two. Just wanted to say that I tried this recipe out last night and it was absolutely delicious! 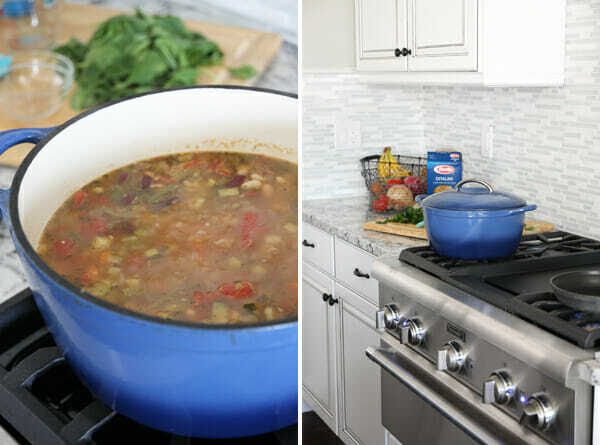 I’ve been trying lots of minestrone soup recipes(looking for one that my husband and kids would like) and this is the first one that we all liked. My husband even said, “This is really good soup!” That is a miracle because he NEVER likes soup! And my 3 year and and 2 year old loved it to. Thanks to you and your fab sis in law for sharing! THANK YOU SO MUCH for posting a vegetarian recipe!! I have followed your blog for a long time, but last fall we embraced a whole foods, plant-based diet after reading/watching Forks Over Knives, Fresh, and Food, Inc. We don’t take any animal products anymore, and have completely limited what oils we eat/use after reading Fats that Kill, Fats that Heal. I used to love your recipes, but so many of them don’t fit my lifestyle anymore. When the recipes just call for olive oil I can caramelize onions with water instead, or just leave it out & we’re good…but knowing what your recipes are like in terms of ingredients you get the idea. you Sara for the recipe. I’m so excited to try it! Beautiful photos and a packed full of veggies recipes = awesome post! could this all the thrown in the crock on a low heat for 8 hours while at work??? I am all about vegetarian food in the slow cooker! did you try this in the crock pot?? 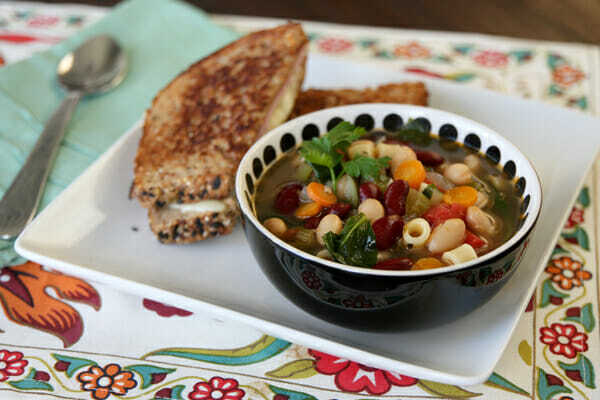 I know my kids would love minestrone if they could just get past those visible veggies…I’m impressed your kids eat it anyway 🙂 Definitely need the grilled sandwich on the side – perfect combo! So are you going to show us the rest of your kitchen??? I would love to see a post on building your house! Made this tonight for dinner. I used beef stock to make it a little richer and it was great! The only vegetable my kids had a problem with was the spinach. May crush or chop it next time to make it less noticeable. May also add some ground sausage as I have meat loving men in my house. Anyone else with the flu? Sorry, somehow my fever riddled fingers somehow posted before I finished! My point was, count this soup as your new favorite for soothing your coughing demolished throat. This filled my dutch oven, and we have been super happy to eat it as leftovers! Thanks for this recipe! I made it the other day, and my 7 yr old daughter was hanging out with me in the kitchen playing with all the veggie scraps as I was chopping. Then, the whole family (including my 7 yr old daughter and 8 yr old son) finished their bowl of this yummy soup for dinner that evening. Such a great way for all of us to eat our veggies! Thanks for sharing, and please keep these healthy recipes coming! Made this tonight and it was good! I was cooking using my kindle and missed that there were 4 cans of beans and I ended up just using one of each type. It didn’t seem to have an impact. I was happy to see a vegetarian recipe. Especially one that didn’t include dairy! Wow you take some great photos! I made this last night, and it was definitely a hit. I also didn’t have to cook it as long, but it may be because my veggies were chopped finer. This was VERY good, I would highly recommend this! Made much more than I thought it would. <3 Thank you for another successful recipe for my home! I just made this and it is delicous. Though truthfully, I’ve never made anything off this website that wasn’t–so kudos to both of you. Thanks for posting! LOVE IT! Thank you! used kale instead of spinach (what I had) and it worked. Can I tell you how much we LOVE your recipes – if you can do more vegetarian/vegan recipes I would be very very very very grateful! My sister likes to point out that then I wouldn’t love your recipes so much, but I believe you can work magic! Thanks for posting! I was going to ask about kale. Just made this for dinner and the whole family LOVED it! Thanks for yet another wonderful recipe!! This is by far the best soup I’ve made. A thousand times thank you. How could this possibly have 30 grams of fat per serving? There is no meat, and only 1 1/2 tablespoons olive oil (21 grams total). Yes the beans have some fat, but minimal. Please explain. Added hamburger, this was absolutely delicious!! Thanks for the great soup recipe, will use time and time again! This recipe is perfectly seasoned. Many recipes have the right spices but not the right quantities. They wash out in cooking and the result is bland or they are unbalanced. Sara, you get an A+. Also stated many times before, this soup is absolutely beautiful and my soup looked like the picture! Yay! Thank you.